Footage is shown from last Tuesday’s episode of “Talking Smack” featuring the epic verbal confrontation between Smackdown Live General Manager Daniel Bryan and WWE Intercontinental Champion The Miz. The Miz went off on Bryan after being told that his style of wrestling is cowardly. Bryan walked off the set as The Miz continued to criticize him. Shane McMahon and Daniel Bryan are watching the clip backstage. Bryan looks disappointed in himself. McMahon says Bryan owes Miz an apology and tells him he cannot provoke talent like that. McMahon agrees with him about his opinion on The Miz, but asks him again to not get in his face. Bryan says he finds this advice a little bit ironic coming from the guy that has beef with Brock Lesnar. McMahon stares off into the distance. The Smackdown video plays, and we’re brought into the arena to see The Miz storming out to the ring before his music even hits with his wife, Maryse, in tow. Miz demands the production crew cut his music. He stands in the ring as the crowd loudly boos him. Miz asks if he has everyone’s attention. Miz warns them not to boo him, which causes them to boo him even louder. Miz says he’s been pushed aside week after week by the commissioner and general manager. It took 148 days to get their attention for a once prestigious title, but it has now been tarnished by quitters and serial failures, but it will be brought up once again by him. Miz says he’s been told he has a soft style and doesn’t like to get hit in the face, but maybe that’s because he’s a great champion. He’s smarter and more talented than the losers that do because he finds ways not to get hit. His general manager won’t apologize to him and the commissioner agrees. The people don’t get it. They don’t see the big picture. They only see the surface. They don’t see what happens back there. Who do they call when they need a spokesperson, a commercial, movie, main event WrestleMania, and play a chicken? They call The Miz. He does it day in and day out without getting injured. Dolph Ziggler’s music hits, and he makes his way to the ring. Ziggler says Miz is making a lot of great points. Miz does it all with the movies and red carpets, but there’s a reason the people won’t get behind him — they see right through him. All WWE Superstars live great lives and go above and beyond to be the best. Miz just wants to be famous. Miz chuckles at that. Ziggler says that’s why no one will ever believe in him. That’s why Daniel Bryan calls him “soft” and a “coward.” Everyone sees through the facade. He just wants to hold a title and be famous. Every week, Miz has a chance to change that perception. Miz can prove that he’s not a coward and that he belongs, but he doesn’t. If Miz wants to talk about opportunities and proving himself to the people, Daniel Bryan, and his wife that he’s not a coward, then he can do it right now. Ziggler says he doesn’t want a title shot or a referee. Ziggler just wants to fight him right here and right now to prove that he’s not a coward. Miz stares a hole through him as the crowd fires up with a “YES” chant. Miz hands the title to Maryse before leaving the ring. The crowd loudly boos. Miz then takes off his jacket and unbuttons his sleeves. Miz gets on the apron and feigns getting in before jumping off the apron and storming off to a chorus of boos. Ziggler says Bryan and the entire world was right. Miz is nothing but a soft, safe coward. Miz begins to storm back to the ring, but Maryse holds him back. A “coward” chant starts up. Maryse talks sense into him, and Miz walks off to the back. The crowd is loudly booing him. Tonight, we’ll see Dean Ambrose take on Baron Corbin in a non-title match. Bray Wyatt will also give a “Sermon for the Serpent.” Coming up next, the Smackdown Tag Team Championship Tournament continues as The Hype Bros take on The Vaudevillains. A pre-taped promo is shown of The Vaudevillains. Simon Gotch says they value sweat on an iron worker’s brow and crushing cartilage with his bare hands. Aiden English says at the top of the list are the Smackdown Tag Team Championships. Aiden English will start against Zack Ryder. They lock up, and English applies a side headlock. Ryder whips him off, but English shoulder blocks him down. English hits the ropes and kicks him in the face before eating a dropkick. Ryder hits a running forearm smash in the corner before punching him down. Ryder goes for the Broski Boot, but Simon Gotch pulls English out of the ring. Ryder baseball slides Gotch down, but English quickly drops him with a swinging neckbreaker on the floor. English gets Ryder back in and picks up a two count. English applies a hammerlock and does some squats. Gotch is tagged in, and he whips English into Ryder before giving him a back suplex for a two count. Gotch applies a hammerlock and does a one-armed push-up. Gotch lifts him up and connects with a rolling fireman’s carry. English is tagged in, and he goes for That’s a Wrap, but Ryder moves. Mojo Rawley is tagged in, and he shoulder blocks English before knocking Gotch off the apron. Rawley shoulder blocks English before viciously clotheslining him. Rawley avalanches him in the corner twice before connecting with a flapjack. Gotch breaks up the pin. Ryder runs in and takes Gotch down before hitting the Broski Boot. English knocks Ryder out of the ring, and Rawley knocks him out with a forearm to the head. Ryder is tagged in, and they connect with the Hype Ryder for the win. The new Smackdown interviewers gets in the ring and says they’re two victories away from becoming the first ever Smackdown Tag Team Champions. Ryder says there are a lot of great teams, but the Hype Train has left the building and isn’t looking back. Rawley says they’re taking the Tag Team Titles because they don’t get hyped — they stay hyped. AJ Styles is walking around telling stage hands that he is the face that runs this place. Styles bumps into Apollo Crews and says his name isn’t important enough to remember. Crews says his name and spells it out. Styles says this isn’t a spelling bee. This is Smackdown Live, and he’s the face that runs the p-l-a-c-e. Styles tells him to write it down and walks off. AJ Styles makes his way to the ring wearing John Cena’s “Never Give Up” headband. An “AJ Styles” chant breaks out as he stands in the ring. Styles says, “Smackdown Live, The Phenomenal One is here! The face that runs the place is here! And the face that beats up John Cena and the face that beat John Cena at SummerSlam and the face that will beat Dean Ambrose.” Styles says Ambrose will see his face in his nightmares and when he’s lying on his back looking at him being crowned the new WWE World Champion. Apollo Crews’ music hits, and he comes out to nearly no reaction. Styles demands that Crews’ music be cut. Styles asks if he’s kidding. Styles asks if he’s here to challenge him to a spelling bee. Crews says he’ll wish it was a spelling bee. He went to Daniel Bryan and got permission to challenge him to a match… right now. Crews charges toward the ring. The bell rings, and Styles jabs him before punching him and putting him in the corner. Styles chops the chest and sends him into the ropes. Crews kicks him in the face, leapfrogs him, and dropkicks him down. Styles gets out of the ring, and Crews follows him out. Crews catches him going back into the ring and sends him into the apron. Crews viciously punches him down and goes over to the commentary table. Crews spells “punch” for Mauro Ranallo. We come back from the break to see Crews trapped in a chin lock. During the commercial break, Styles sent Crews into the ring post. Crews fights up and punches out. Styles forearms him right back and hits the ropes, but Crews comes back with two clotheslines. Crews boots him in the head and splashes him in the corner. Crews takes him down with a leaping clothesline and kips up. Crews goes for an Olympic Slam, but Styles gets out of it. Styles arm drags him down and charges, but Crews gives him a back body drop over the top rope. Crews then takes him out with a moonsault block off the apron! Crews gets him in the ring and punches away at him in the corner. Crews puts him on the top rope and goes for a superplex, but Styles slips through the legs and takes him down. Styles connects with a clothesline in the corner. Styles gets on the ropes and leaps off, but Crews catches him and connects with a fall-away slam/Samoan Drop for a near fall! Crews cannot believe he kicked out. Crews goes to the top rope, but Styles charges him. Crews leaps over him and charges, but Styles boots him in the face. Styles snaps him off the top rope and gets on the apron. Styles takes him down with the Phenomenal Forearm for the win. Dean Ambrose will take on Baron Corbin in a non-title match in tonight’s main event. The commentators talk about Heath Slater’s quest for a Smackdown Live contract. If he and Rhyno win the Tag Team Championship Tournament, he’ll get a contract. We’re shown footage from this past weekend when Renee Young went to Heath Slater’s trailer in West Virginia. Rhyno is shown there looking focused. Slater’s “wife,” Beulah, is introduced. She’s rather portly and uses uncultured language. She loves the fake roses Slater gave her on their wedding day. She gives them crackers and Cheese Whiz. Renee says she’ll pass. She asks about Slater not being chosen in the WWE Draft. Slater says it was an oversight. One thing he is not is an afterthought. Beulah says she has pizza crust for dinner. Renee asks him about the night he confronted Brock Lesnar. Slater says not many have stood toe-to-toe with Lesnar, but he did. Slater says he’s lucky to be alive. Renee brings up that he defeated Randy Orton two weeks ago (by disqualification), but Shane McMahon and Daniel Bryan denied him his contract. 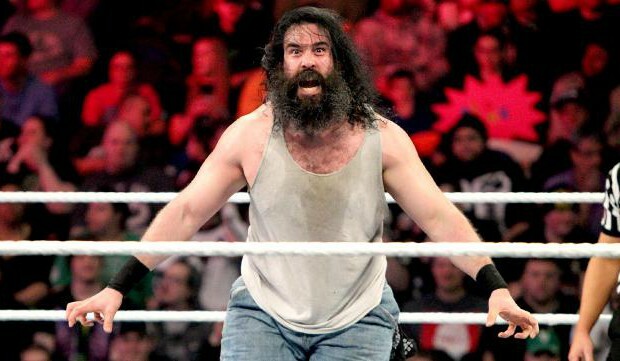 Slater says he got confused with Bryan’s beard and Mick Foley’s beard. That’s why he called Shane McMahon by his sister’s name. Renee asks about teaming with Rhyno to become the first Smackdown Tag Team Champions. Beulah is seen disgustingly eating crackers. Slater says he’s lucky to have Rhyno. It’s not for him anymore. It’s for his family. Beulah burps in the background. Renee looks disgusted. Renee asks Rhyno why he decided to team up with Slater. Rhyno just shrugs. Slater says Rhyno is helping him provide for his family. When they win the Tag Team Championships, he’s going to upgrade from this trailer to a double wide. Beulah says she wishes they could meet their kids. Renee asks if they’re in school, but Slater says they’re in the back picking up bottles. A car zooms by the house, and Slater angrily leaves with his wife. Rhyno smiles at Renee in a creepy manner. Bray Wyatt makes his way to the ring with the arena lit by the fireflies. Wyatt gets in the ring and sits in his rocking chair. Wyatt says he doesn’t fear snakes or monsters. He fears no man because he is fear. When he thinks about the legend of Randy Orton, he doesn’t think of him as a mythological serpent. He thinks of him as just a man. This man believes he has venom running through his veins, and that excites him. Wyatt says Orton is sick, but that’s what he likes about him. What Brock Lesnar did to Orton at SummerSlam, Wyatt found interesting. Lesnar exposed all of Orton’s flaws. Orton went into the fight as a man that had no fear and thought he was untouchable. Orton came out of the fight as a man that was damaged. Wyatt says that’s his game. He eradicates the infected. If Orton has voices in his head telling him what to do, then he prays that the voices are telling him to run. Wyatt warns him to run and laughs. Randy Orton’s music hits, and he slowly makes his way to the ring. Orton stops at ringside. A “Randy” chant fires up. Orton says the voices in his head are asking him who Wyatt thinks he is. Wyatt thinks he’s damaged because he has a handful of staples in his skull. Orton says he’s been damaged for a long time. That’s what gives him his charm. From one damaged man to another, Wyatt has his attention. Wyatt says this is the Randy Orton he was hoping for. This is the predator he wanted to see. Orton is covered in scars, but he’s not afraid. Wyatt says Orton is no longer the predator in this situation. Orton is damaged and weak. Wyatt says he’s the predator now. Orton should know better than anyone what a predator does best: he kills. At Backlash, he’s going to cut the serpent’s head off and hang it on his mantle, just like the trophy Orton is. Orton gets in the ring, and Wyatt’s video immediately flashes on the screen and the lights go out. That’s all we see. Coming up next, Alexa Bliss and Natalya will take on Naomi and Becky Lynch. Nikki Bella will be on commentary for the next match. Footage is shown from last week’s Smackdown when Carmella attacked Nikki Bella from behind and gave her the Bella Buster. We then see footage from last week’s “Talking Smack” when Carmella viciously attacked her again. Natalya will start the match against Naomi. Natalya sends her to the corner, but Naomi boots her in the face. Natalya quickly slams her on her tailbone, but Naomi quickly takes her down. Naomi hits the ropes and takes her out with a hurricanrana. Natalya rolls out of the ring to recover. We come back from the break to see Natalya applying a headlock to Naomi. Naomi fights up, but Natalya slams her down before knocking Becky Lynch off the apron. Alexa Bliss is tagged in, and they slam Naomi down. Alexa puts Naomi on the middle rope and chokes her. Alexa stands on her before letting her up. Naomi quickly punches her back and knocks Natalya off the apron before dropkicking Alexa. Alexa stops her from making the tag and punches away at her. Alexa applies a neck vice, but Naomi fights up. Alexa knees her in the midsection, but Naomi comes back with a double eat defeat. Becky is tagged in, and she clotheslines Alexa twice before knocking Natalya off the apron. The crowd is going wild for her. Becky takes Alexa down with a leg lariat before doing a straight fire forearm in the corner. Alexa quickly elbows her and drops her on the apron. Becky punches her back and goes to the top rope. Becky hits her with a mistimed missile dropkick, and Natalya breaks up the pin. Naomi throws Natalya out of the ring. At ringside, Carmella attacks Nikki Bella on commentary. Nikki powers her into the apron, but Carmella kicks her away and throws her into the barricade. In the ring, Alexa rolls up a distracted Becky and grabs a handful of tights to pick up the win. Becky Lynch and Naomi check on Nikki Bella, who is still down at ringside. Coming up next, we’ll see the return of The Headbangers. A video plays highlighting who The Headbangers are. It’s been sixteen years since they’ve appeared on WWE television. Another Curt Hawkins video plays with some more ridiculous facts. Heath Slater will start the match against Headbanger Mosh. Mosh does a little jig, and Slater responds in kind. Slater applies a side headlock, but Mosh whips him off. Slater ducks a clothesline and shoulder blocks him down before taunting the crowd. Mosh quickly takes him down and grabs him on the apron. Mosh takes him out with a springboard clothesline to the floor! Headbanger Thrasher is tagged in, and he takes Slater down with a middle rope clothesline. Slater comes back with some punches, but Thrasher takes him down with a back suplex. Thrasher punches him down and tags Mosh back in. They send Slater into the ropes and connect with a double-team flapjack. Mosh picks up a two count. Mosh applies a chin lock as David Otunga hilariously calls The Headbangers, “Marilyn Manson’s last two fans.” Slater fights up, but Mosh knees him in the midsection. Mosh sends Slater to the corner and connects with a running hip attack. Mosh then takes Rhyno down on the apron. Thrasher is tagged in, and The Headbangers take Slater out with the Stage Dive! Rhyno breaks up the pin. Rhyno was busted wide open by Mosh’s attack on the apron. Rhyno knocks Mosh out of the ring and pulls Slater to their corner. Rhyno is tagged in, and he viciously Gores Thrasher down for the win! Heath Slater and Rhyno celebrate their big win. They’re advancing in the Tag Team Tournament to face The Hype Bros. Slater is also bleeding from his mouth. Coming up next, Dean Ambrose will face Baron Corbin. Someone is in the ring by the name of Gary “The Milkman” Millman. He says he’s been granted a license to fight tonight, but no one wants to get in the ring. He says he’s not leaving the ring until a competitor comes in the ring. This guy looks like a heavier Jinder Mahal. The man starts removing his suit and strips down to his tighty whities and black socks. Demon Kane’s music hits, and he slowly makes his way to the ring. The Milkman starts trying to put his pants back on, but Kane is already in the ring. Kane grabs The Milkman by the throat and gives him a Chokeslam before simply leaving the ring. Charles Robinson, the greatest referee of all time, is the official for this match. They circle the ring and lock up. Ambrose applies a waistlock before applying a side headlock. Corbin whips him off and shoulder blocks him down. Corbin knees him in the midsection and punches him. Corbin punches away at him in the corner before kneeing him in the midsection once again. Corbin sends him into the ropes, but Ambrose ducks a clothesline and takes him down with a running cross-body block. Ambrose punches away at him and clotheslines him out of the ring. Ambrose gets on the apron and takes him out with a clothesline off the apron. Ambrose bounces Corbin off the commentary table and stares at AJ Styles. Ambrose gets Corbin in the ring and looks at Styles. Corbin grabs him by the hair, but Ambrose snaps him off the top rope. Ambrose then connects with a missile dropkick. Ambrose connects with a running forearm and goes for a bulldog, but Corbin sends him into the turnbuckle before clotheslining him in the back of the head. Corbin punches away at him and stomps him. Corbin stands on him before throwing him out of the ring. We come back from the break to see Corbin standing over a downed Ambrose. Corbin taunts the crowd before applying a modified chin lock. During the commercial break, Corbin sent Ambrose into the steel steps. Back to live action, Ambrose fights up and elbows out. Ambrose hits the ropes, but Corbin forearms him. Ambrose goes for a Lunatic Lariat, but Corbin counters with an STO for a near fall. Corbin argues with the referee over the count. Corbin kicks Ambrose before reapplying the chin lock. Ambrose fights up and punches out. Corbin knees him in the midsection, but Ambrose sends him to the corner. Corbin slides out of the ring and runs back in, but Ambrose drops him with a neckbreaker. Ambrose punches away at him, but Corbin knees him. Ambrose gets out of a scoop slam and goes for Dirty Deeds, but Corbin sends him into the corner. Ambrose avoids a charging Corbin, and he hits the ring post shoulder first. Ambrose quickly rolls him up for a near fall. Corbin quickly comes back with a vicious clothesline. Corbin is already done selling the shoulder into the ring post. They trade punches until Ambrose wipes him out with the Lunatic Lariat for a near fall. Ambrose goes to the top rope, but Corbin cuts him off. Corbin punches away at him before climbing up for a superplex attempt. Ambrose fights out and punches him to the mat. Ambrose gets on the apron and pulls the top rope down to get Corbin out of the ring as he charges him. Ambrose hits the ropes and wipes him out with Air Ambrose! Ambrose lays across the barricade for a moment. Ambrose gets him in the ring, and Corbin comes back with Deep Six for a near fall! Ambrose gets out of the ring to recover. Corbin sends him into the barricade and stares down at him. AJ Styles gets up from commentary and demands Corbin stay on him. Corbin gets in his face and says no one tells him what to do. Ambrose attacks Corbin from behind, subsequently knocking Styles down. Ambrose gets Corbin in the ring and takes him out with diving elbow drop for a near fall. Styles gets on the apron, and Ambrose scares him off. Corbin rolls up Ambrose for a near fall. Ambrose tries for Dirty Deeds, but Corbin fights out. Corbin goes to throw Ambrose into Styles, but Ambrose ducks and Styles accidentally hits Corbin with a knee to the face! The referee calls for the bell. Ambrose immediately takes Styles out with a plancha and punches away at him. Styles comes back by throwing Styles over the commentary table. Ambrose punches away at Styles until Corbin attacks him from behind. Corbin gets in the ring, and Ambrose drops him with Dirty Deeds. Styles gets on the apron and goes for the Phenomenal Forearm, but Ambrose crotches him up there. Styles screams in pain, and Ambrose puts a hand on his shoulder before giving him some advice. Ambrose then shakes him on the rope before shaking his hand. Ambrose takes the WWE World Championship and poses next to Styles, who is still in extreme pain. Ambrose then walks off.